PACK IT IN, PACK IT OUT – This is a wilderness area. There are no trash cans, please be prepared to pack out all of your trash. NO RESTROOMS – This is a wilderness area. The closest restrooms are about 2 miles away in the day-use area. NO DIVING – There are large and sharp rocks that are not deep enough under the water to allow for safe jumping. Park in the day-use area, located off Highway 9 in Felton. 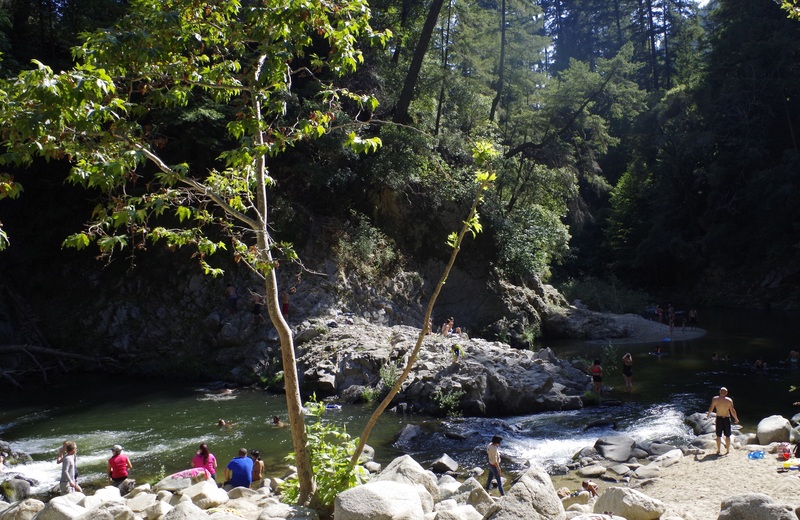 Trailhead: Pipeline Road – Hike Pipeline Road for approximately 0.5 miles, then cross the San Lorenzo River at the seasonal bridge (near the train trestle). Hike Ox Fire Road next to the railroad tracks for approximately 0.75 miles, then make a left to continue on Ox Fire Road to head down towards the river and Garden of Eden. Park in the Ox Fire Road turn out, located 0.75 miles south of the Park’s main entrance on Highway 9. Look for the State Parks sign and the green gate. This is a small parking turnout, parking in the day-use area during the busy summer season is recommended. Trailhead: Ox Fire Road (green gate); approximately 0.75 miles one-way, elevation change 200 feet. *Please note that there is no lifeguard on duty and water quality varies.